What the heck is going on in Florida? That’s the question many cannabis entrepreneurs are asking after the release of several new polls showing vastly different support levels for a medical marijuana legalization measure that will appear on the November ballot. A survey taken earlier this month found that just 48% of registered voters back the amendment – signaling that the measure could suffer a resounding defeat (it needs at least 60% to pass). Yet a separate poll taken around the same time found support at around 67%, indicating the proposal will win by a wide margin. What’s more, there’s an eye-popping 40-point gap between recent polls that found the highest level of support, 88%, and the lowest, 48%. That level of disparity almost never happens in politics. More often than not, polls follow a distinct trend and are usually no more than a few points apart – certainly not with 40-point swings. As a result of the wildly differing polling data, entrepreneurs who began formulating plans for MMJ businesses when support was consistently high are now unsure about what to believe and how to proceed. So which poll is the most accurate? It’s hard to say, as there are many factors at play. The political tracking site Ballotpedia has an aggregate of 15 separate surveys taken between last November and Oct. 12, with an average of 66% support. But all these polls differ in various areas, such as the number of Florida residents polled. Some questioned well over 1,000 residents, and some less than 500. Every poll that involved more than 1,000 Floridians found Amendment 2 passing with at least 69% support. The wording of polls can also elicit different results. Those that more closely mirror the actual ballot language could offer a more realistic view of support. A University of North Florida survey from this month asked 471 likely voters if they would back an amendment that “allows the medical use of marijuana for individuals with debilitating diseases as determined by a Florida physician.” That question received 67% support – lower than the 80% level in some polls with broader language, but well over the threshold need to win. Still, the fluctuation in poll numbers from the past few months can’t necessarily be written off because some surveys ask questions that mirror the text of the ballot and others are more broad. “What I find really fascinating is I’ve seen polls where it’s almost identical language, and there’s a 13-point spread,” Capecchi said. One possible factor: voters simply haven’t made up their minds – or they are changing where they stand, said Peter Bergerson, a political science professor at Florida Gulf Coast University. This is especially feasible with a still-controversial topic such as marijuana. One factor in polls that show lower levels of support is that Drug Free Florida, the anti-Amendment 2 committee, has ramped up its campaigning since late summer. The group – which has received $4 million from casino mogul Sheldon Adelson – started running a pair of TV ads in September. “They’ve been beating the crap out of us every day on TV with misleading ads,” said Ben Pollara, campaign manager at People United for Medical Marijuana, the group behind Amendment 2. Maurizio Passariello, communications director for People United, said Drug Free is operating under the assumption that the Florida Legislature will take zero action if the amendment passes. He pointed out that Amendment 2 only enshrines in the state constitution the right to medical marijuana for qualified patients, but leaves regulating the industry and caregivers up to the state. “They’re not really giving a fair picture of what the amendment does or what it’s intended to do,” Passariello said. Bergerson described the Drug Free ads as “borderline half-truths.” But the reason political campaigns resort to such tactics is because they work. “They’ve had a toll. And there hasn’t been a counter-opinion… as pervasive and prevalent as the anti- ads have been,” Bergerson said. A spokesperson for Drug Free Florida did not return a call seeking comment. Pollara and other supporters remain confident that Amendment 2 will get at least 60% on Election Day, saying their own internal polls show support well above that mark. “Our polling has us winning, and I’m going to trust our pollsters,” Pollara said. There have been at least four polls since August that show Amendment 2 falling short and another that shows the contest as a coin flip. Although numerous other polls show it passing, it’s far from a lock. Another factor to consider, said Bergerson, is that these are midterm elections. When it’s not a presidential year, turnout is typically much lower, and the youth vote is often far below what it was in 2012 or 2008. The professor hypothesized that Amendment 2 will top out around 50-55% support on Election Day. The disparate polls haven’t hurt fundraising efforts for the cannabis campaign. But they might have other ripple effects, including declining voter morale – which could dampen turnout on Election Day. 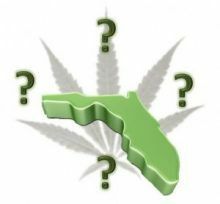 The uncertain situation could also influence companies who were previously planning on starting MMJ businesses in Florida. Altmed – which donated $50,000 to People United between September and October – is one of dozens of firms hoping to set up shop in Florida. Smullen said Altmed is moving forward with its operation regardless of whether Amendment 2 passes, because the company wants to be a supplier of high-CBD medical cannabis that the state Legislature approved earlier this year. But, Smullen noted, not every cannabis entrepreneur interested in Florida is in the same boat. Plenty of small businesses don’t have the same amount of resources as Altmed. These companies could be forced to wait until 2016 or later for another MMJ ballot measure if Amendment 2 fails. Another interesting factor in polls versus election results is the fact that most pollsters only solicit responses from people with land lines due to limitations in the technology. About 40% of potential voters only have cell phones now, and most of them are younger voters and therefore more likely to favor improvements to marijuana laws. I hope it passes I hate breaking the law and the medicinal qualities of this plant need to be exploited as well as the commercial aspects of the hemp itself . Factor that with all the people who will not be in the judicial/prison system and the millions of dollars that come from that I can not understand peoples objections . Florida is really tough with 60 percent of the vote needed to win. It also takes millions of dollars. John Morgan the main backer of the initiative has said if it loses he won’t do it again so for patients like his brotherI really hope it passes. I’m voting yes on 2, so is my wife. …in the meantime medical marijuana is proving its value as a bonafide medication case-by-case, state-by-state. I visited my doctor yesterday and asked if he was in favor of amendment 2. According to him he gets that question from clients at least 4 ‘s/day. He tells them the intention of the amendment has been hijacked by those from the republican party and law enforcement across the state who have succeeded in confusing voters over the wording instead of the real medical benefits intended for those that need it.He said medical cannabis works for 95% of those who need it.If he fails care in Florida will be set back to the 1950’s leaving patients to deal with the black market or die in unnecessary pain that a simple plant could provide a quality of life better then the FDA ever dreamed of. Thanks for your comment. That makes me feel better for the people in Florida that need medical marijuana that will help them feel better with out all the side effect of prescription medicine.I live in Colorado thank goodness. You would think with all them Boomers that live there that it would have no trouble passing. From one Boomer to others,” Vote for MMJ for yourself and others”. I say good luck,Florida.